Picotee Lace begonias are the reverse of regular Picotee begonias: the petals are dark colored with contrasting lighter edges. The flowers are large: up to 6"/15 cm. The deep green leaves accent the lighter, wonderfully heavily pleated blooms. In borders, flower beds, pots and hanging baskets. Usually sold by color only. * PLANTING NOTE: do not plant too deep, rounded side down, hollow side up just below or at soil level. Adjust your planting dept according to the size of the bulb. 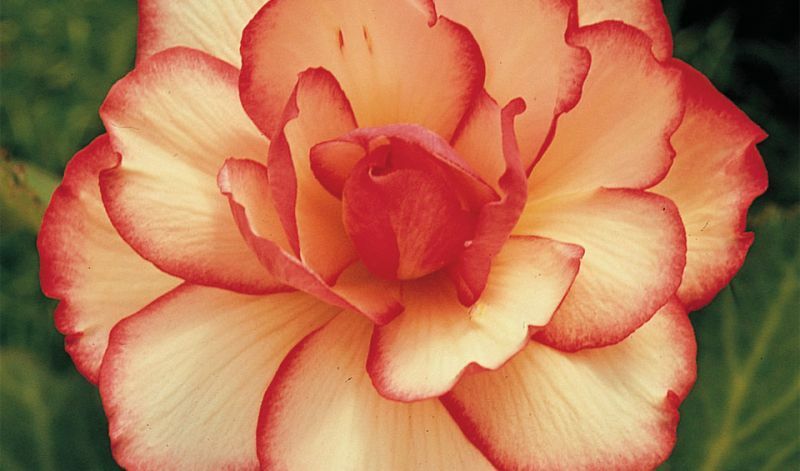 In the 1860's a number of tuberous begonias were discovered high in the forests of Bolivia and Peru, in the Andes mountains of South America. The genus Begonia has over 1,500 species. Here we only make mention of the 'tuberous' begonias that have been subdivided into various groups (depending on their flower form) each of which contains several hybrids which are in general only identified by their color. Next to bedding begonias ('Semperflorens') tuberous begonias are probably the best-known and most widely grown and enjoyed by the average gardener around the world.